I am always looking for new cookie recipes to try. Yes, I am well aware that I have a cookie obsession and I am 100% ok with that. I recently stumbled upon a recipe for Oreo Cheesecake Cookies on Tasty Kitchen and knew I had to try them. This recipe comes from Heather of multiplydelicious. The cookies are insanely delicious. 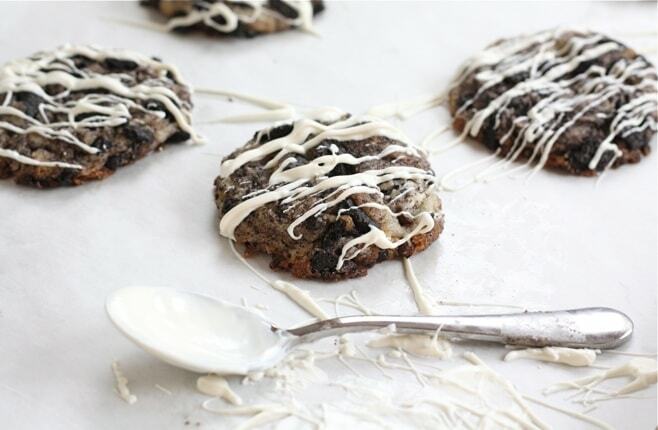 An Oreo cookie crushed up inside another cookie, plus cream cheese! That is three desserts in ONE folks! Oh, and the cookies are drizzled with white chocolate. Hello! I know you are all dying for the recipe so head on over to Tasty Kitchen for step-by-step instructions and the Oreo Cheesecake Cookie recipe. Thanks Ree (a.k.a The Pioneer Woman, like you didn’t know that..ha!) for having me guest post. It was a ton of fun! While you are there, make sure you check out other tasty recipes or add your own! If you aren’t already friends of Two Peas and Their Pod on Tasty Kitchen, add us! We would love to see you over there! 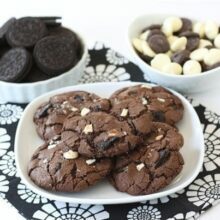 I also have a cookies obssession… Those look wonderful. I also have a cookie obsession and I’m 100% okay with it as well. 😉 These look divine!! 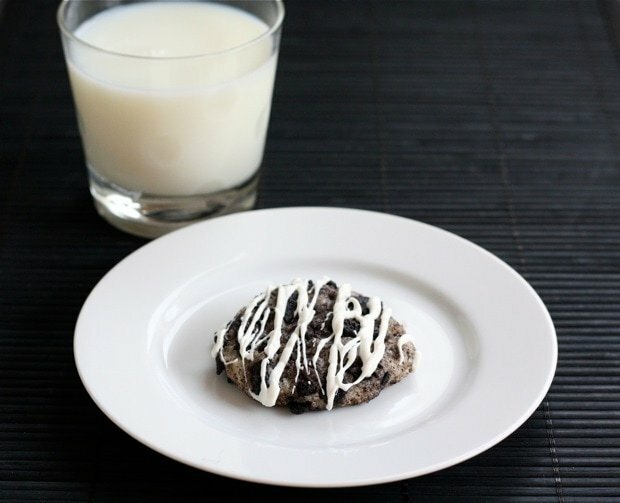 These oreo cheesecake cookies look crazy great – i’ll go check out the recipe now! i love oreos and think this is such a genius idea maria! just need elastic waistbands now! These cookies look so AMAZING. Been drooling over them since Wednesday! Added them to my Christmas cookie list! I wish I had these now. I think my life would be better! Way to go on the guest post, Maria. These cookies look fantastic! These will be making my “to make list” for handout around the holdiays! These are great holiday cookies. I added them to my list as well. These sound amazing. I’m saving this recipe for sure. Now this is my kind of cookie! These look incredibly delicious – I could go for one right now, even though it’s still morning! 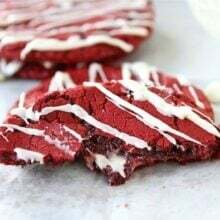 I share your cookie obsession and these look amazing!!! I can’t wait to make them! Looks great! Love cream cheese in cookies! Ohh my goodness these sounds incredible. One of my favorite pies if oreo..I just like the crisp/creamy texture. I wish I could grab one right out of the screen. Um, cookie love at first sight! I love this this. 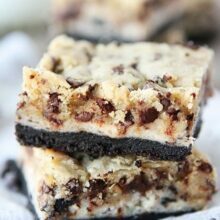 . . oreo, cheesecake, chocolate drizzle-I’m all over this! Dangerously delicious! 🙂 Great photos too! Oh my goodness…. over the top!! These look so amazing! Thank you for the suggestion 🙂 I need to get some oreos! Wow these cookies keep haunting me, I turned away from it yesterday but I think I will have no choice but to make these. i REALLY want one of these right now! i love anything with oreos, yum! Those look so, so yummy!! I’m adding them to my recipes to try list! I can’t wait to try these – they sound so good Maria! Help, the cookies were haunting me so I made them but mine spread like crazy and look nothing like these. I cook and bake very well, followed the recipe to a t, but this recipe didn’t work for me. Should they be chilled before cooking? Tracy-sorry the cookies spread on you. They were fine for us. Hmmm…maybe try adding a little more flour or chilling the dough before baking. Moan. I love all of your cookie recipes but I have an especial weakness for oreo anything. Amazing. These look like yum! I saw your guest post on TK – very nice!! This is the most watering cookie I have seen in a while! Bookmarked! Sheesh, Maria, those look and sound de-lish! Wow, these look like quite the crowd pleaser and super addicting – yum! This is not fair – too delicious….you are bringing some to Cali right? Cookies with oreos and cheese?? YUM! oh wow these are brilliant! oreo anything has gotta be delicious! 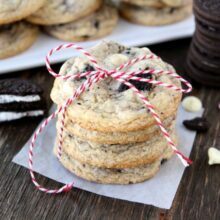 These cookies are TOTALLY up my alley!! Love them, can’t wait to make ’em! I think the *only* thing that could make these cookies better is if you made a “sandwich” out of them, with cheesecake in between 🙂 Not possible, perhaps, but it is nice to dream. These do look amazing! I also love TASTY KITCHEN – thanks for sharing! I could easily devour this entire plate, great recipe!! I just added these to my “to bake” list. They are beautiful! This is probably so much better than eating an oreo on it’s own. Yum! Oh my goodness these look delicious!! Cannot wait to try them! Dear Josh and Maria. I fell in love with all these Cookiereceipes 🙂 I’ve tried this one and I love it! They’re so yummy! I checked out this recipe on Tasty Kitchen and it scored in my book. First reason for winning: easiest cleanup ever! I didn’t need very many measuring cups or spoons, it was all mixed in one bowl and the parchement paper on the cookie sheet meant I didn’t need to wash them up afterwards! I love baking and hate cleaning so this is a great match for me. These were really easy to make and would recommend them to people who have a sweet tooth. The texture of the cream cheese inside makes it almost like cookie dough and it’s delicious if you’re into that. The only variation I made was using full sized chocolate chips instead of mini and the cookies turned out just fine. A cookie addiction is not even close to what I have. This looks ridiculously good! !